Abingdon Presbytery includes 48 congregations, 39 Teaching Elders (14 of whom are Honorably Retired), and 9 Commissioned Ruling Elders, working together in thirteen counties in southwestern Virginia. June, 2016 is the date set for the next Mission Trip to Kenya. 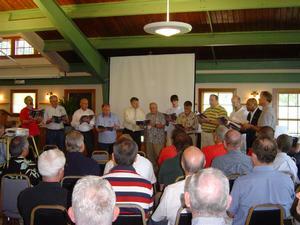 Presbyterian Men represent all men of the Presbyterian Church from Delaware to North Carolina. This website contains information about our Mission and Purpose, our work with overseas missions, and programs of the men, including our annual conference. 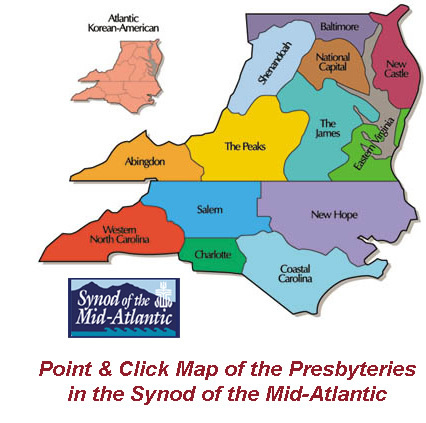 You can also link to the 15 Presbyteries within the Synod of the Mid-Atlantic to find out what is going on locally. Access the “Resources & Links” page to connection with various other organizations that may be of interest to you. You may also link to our quarterly newsletter and our Facebook page. If you wish, we will add your email to our address list for future newslettersand other communications. Are you or do you know a man who is active in ministry to men and able to lead others. The Presbyterian Men's Council of the Synod of the Mid-Atlantic is currently looking man to serve as the Synod Council representative to the council from the Presbytery of Costal Carolina. Contact Ron Crick for more information.